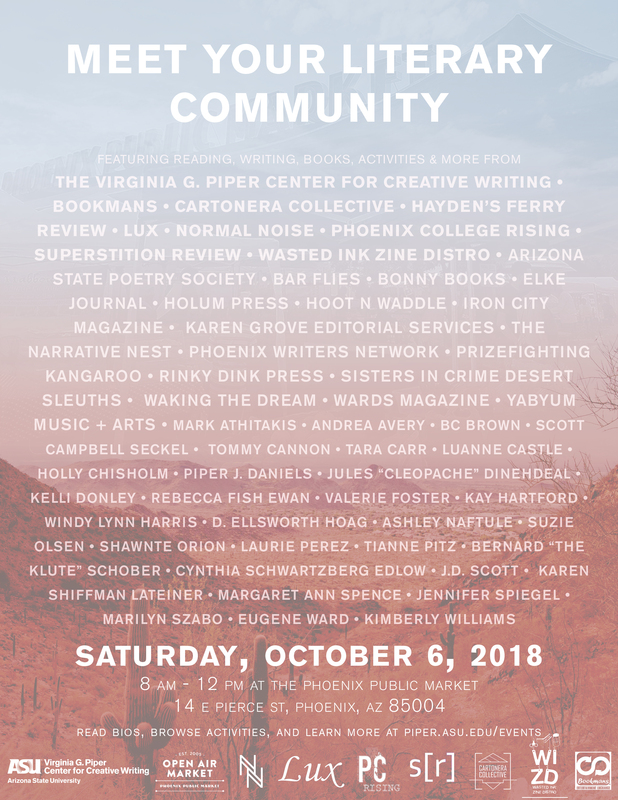 The Virginia G. Piper Center for Creative Writing has teamed up with the Open Air Market at the Phoenix Public Market to present Meet Your Literary Community, a morning of literary activities, presentations, and programs on Saturday, October 6, 2018 from 8:00 a.m. to 12:00 p.m. at the Phoenix Public Market (14 E Pierce St, Phoenix, AZ 85004). Bringing together nearly 50 local authors and literary organizations from all across the Valley, Meet Your Community features numerous literary programs and activities for people to engage with the literary community, including book exchanges, local author readings, writing groups, zine workshops, poetry on demand, scavenger hunts, and more. Meet Your Literary Community is a partnership between the Virginia G. Piper Center for Creative Writing and the Open Air Market at the Phoenix Public Market. Featured organizations include Bookmans, Cartonera Collective, Hayden's Ferry Review, Lux Undergraduate Review, Normal Noise, Phoenix College Rising, Superstition Review, and Wasted Ink Zine Distro. To learn more about the day's activities and see a full list of local authors and literary organizations, you can review the information below. Meet Your Literary Community features nearly 50 local authors and literary organizations from across the Valley. The Arizona State Poetry Society is a non-profit organization that was born at nearly the same time as the UA Poetry Center in the mid-1960's, and our founders are some of the same people who participated in creating the nationally recognized center. We have branches that meet monthly in Peoria, Tempe, Scottsdale, and Tucson, and members all over Arizona and the US. We publish Sandcutters, a journal of member poetry and annual contest winners. Our members range from published poets to beginning poets. We hold craft talks and open readings several times a year. We are a member of the National Federation of State Poetry Societies. We seek to build community among all poets in Arizona and nationally. Mark Athitakis is a critic and essayist whose work has appeared in the New York Times, Washington Post, Los Angeles Times, Humanities Magazine, Virginia Quarterly Review, and numerous other publications. He is the author of The New Midwest, a survey of the region's fiction, and a former board member of the National Book Critics Circle. He lives in Chandler. Andrea Avery is an Exnglish teacher and the Director of Curriculum and Instruction at Phoenix Country Day School. Her writing has appeared in Ploughshares, The Oxford American, Real Simple, and The Politics of Women's Bodies. She is a finalist for the 2018 Phoenix Mayor's Arts Awards in Literary Artist category. She volunteers for the Arthritis Foundation and teaches courses at the Piper Center. Bar Flies is a live reading series held monthly at Valley Bar in downtown Phoenix. Entering its fourth season, the event is sponsored by Stateside Presents. Co-curators Amy Silverman and Katie Johnson work with five writers each month to get stories from the page to the stage. Participants range from beginners to established writers/performers. Performers are paid. There's a theme each month (for example, August 2018 is True Colors ) and a DJ curates a play list that complements the theme and each essay. The event regularly sells out. For several years, each January Bar Flies Boot Camp (a collaboration between Changing Hands and Valley Bar) has allowed participants to write/workshop/rehearse/perform a piece—all within one day. This spring, additional workshops will allow students more time to develop and rehearse essays. And Shoo Flies, Bar Flies' little sister, is expanding in 2018-19 from a one-off to a regular series including workshops and performances for teens. BC Brown is a hybrid published author of six books. She released A Chimerical World: Tales of the Seelie Court in February 2015 to the delight of fantasy readers. She is the author of Sister Light, Book One: Of Shadows (published under the pen name B.B. Walter), the paranormal mysteries A Touch of Darkness and A Touch of Madness. She has work published in two anthologies Fracas: A Collection of Short Friction and Quixotic: Not Every Day Love Stories. She is the founder and coordinator of Humans Being Human, a weekly homelessness outreach program in Phoenix, Arizona. She is also a co-organizer of Planned Parenthood Supporters of AZ, a volunteer organization that provides safety escorts to clinic patients. BC loves karaoke, happy the community accepts a deaf wanna-be singer with a flair for theatrics; is allergic to coconut, and has as many costumes in her closet as she does everyday wardrobe. Bookmans Entertainment Exchange is a bookstore at our core, and for over 40 years we’ve operated on the assumption that used books, along with movies, music, and other media deserve the chance to be discovered on our shelves, not in the local landfill. Our 6 stores in Tucson, Phoenix, Mesa & Flagstaff are open 7 days a week from 9am-10pm. To learn more, visit www.bookmans.com. Bonny Books LLC is a family bookstore operated by sisters (one a US Army Veteran and the other a Single Mother of two) in honor of their grandmother who documented family history through poems. The goal is to provide not only literature and educational materials but also a place for the community to gather for social events (book clubs, book signing, poetry readings, after hours special events for parent's night out, creative writing classes, tutoring, etc). Scott Campbell Seckel is a writer living in Phoenix, Arizona. His first novel, Arizona Time, explores the post-frontier West through contemporary Arizona. He is from Sag Harbor, New York. I'm Tommy Cannon. I am a cartoonist, writer, teacher, and comedian living, working, and playing in Phoenix, Arizona. My comedy both on the page and the stage skews toward the absurd. I created Fred the Mustard Packet, which can be found on Webtoons. I also make Dr. Zombie for TGGeeks.com. And, I'm on the art crew for Philip Haldiman's My Big Break. Tara Carr is a contemporary romance author and native Arizonan. Someone once told her that if the characters in her head were driving her crazy, it was time to put them on paper. So she did. She hates to cook and do laundry, but she loves to read, write (obviously! ), go camping with her furry kids and spouse, wander through cemeteries, and listen to music that hasn’t been popular for decades, much louder than her neighbors would prefer. Her books are all standalone, and the only thing they have in common is they’re all named after songs on her iPod. Shakespeare wrote, "If music be the food of love, play on!" and Tara takes this to heart. Cartonera Collective (a program of Cardboard House Press) is a team of book makers devoted to the production of bilingual book art from Latin American authors. Cardboard House Press is a 501c3 nonprofit organization devoted to the creation of spaces and media for cultural, artistic, and literary development through the publication and circulation of writing, art, and contemporary thought from Latin America and Spain and through bilingual events, community projects and workshops. Our work serves as a platform to exchange ideas and highlight meanings that stimulate diverse human connections and social actions. Luanne Castle's Kin Types (Finishing Line Press), a chapbook of poetry and flash nonfiction, was a finalist for the 2018 Eric Hoffer Award. Her first poetry collection, Doll God, winner of the 2015 New Mexico-Arizona Book Award, was published by Aldrich Press. She studied at the University of California, Riverside (PhD); Western Michigan University (MFA); and Stanford University. Her writing has appeared in Copper Nickel, Verse Daily, Lunch Ticket, Grist, River Teeth, and other journals. Holly Chisholm is the artist of Just Peachy Comics, and is currently living in Phoenix, AZ with her boyfriend Matt, a puppy named Bubbles, two dwarf hamsters and a cranky cockatiel named Larry. Piper J. Daniels is the award-winning author of Ladies Lazarus (Tarpaulin Sky Press, 2018). A Michigan native and queer intersectional feminist, she specializes in hybrid forms and is a passionate advocate for mental health and suicide prevention, queer empowerment, body positivity, and sexual assault reform. Her debut essay collection was described by Publisher’s Weekly as "beautifully written...Daniels emerges as an empowering and noteworthy voice.” She lives in the American Southwest where she and her partner raise two sweet, energetic puppies and a very stylish cat. Kelli Donley is a native Arizonan. She is the author of three novels, Under the Same Moon, Basket Baby and Counting Coup. She has written for local magazines and newspapers. She studied journalism at Northern Arizona University and public health at the University of Arizona. Kelli lives with her husband Jason in Mesa. She works in public health, and blogs at www.africankelli.com. ELKE Journal is an online and in-print publication seeking to publish quality work from emerging and established authors. Rebecca Fish Ewan is a poet/cartoonist/writer & founder of Plankton Press, where small is big enough. Her writing, cartoons & hybrid-form work appears in Brevity, Punctuate, Under the Gum Tree, Mutha and Hip Mama. She makes zines and teaches in The Design School at Arizona State University (her creative writing MFA home). She has two books of creative nonfiction: A Land Between and By the Forces of Gravity: A Memoir. Rebecca grew up in Berkeley, California, & now lives in Tempe with her family. Valerie Foster is an award-winning writing educator, and the author of The Risk of Sorrow: Conversations with Holocaust Survivor, Helen Handler, archived in six countries, along with a short story, “Loss,” published in the River Poets Anthology, and memoir, Dancing With a Demon, named Best Nonfiction Narrative by American Book Fest and Finalist by International Book Awards. With public speaking in Vancouver, B.C., Los Angeles, San Diego, Texas, New York, and throughout Arizona, she has been featured on Pat McMahon’s The God Show, Arizona Republic, Jewish News, East Valley Tribune, and VoyagePhoenix Magazine. Kay Hartford writes literary and speculative fiction and mysteries. Her first byline was a short story published in 1982 in Ellery Queen Mystery Magazine. It led to nonfiction assignments for local magazines and newspapers, which in turn took her to a staff job at a business journal chain and a two-decade newspaper career. In 2016, Kay turned back to fiction. She releases two books each year, a mystery in spring and an experimental novel in the fall, under her Nineteen Cents Press imprint. Founded in 1986, Hayden’s Ferry Review is a semi-annual & international literary journal edited by the MFA students at Arizona State University. Work from Hayden’s Ferry Review has been included in the Pushcart Prize Anthology, Best American Poetry, and Best New Poets. HFR has notable pieces in Best American Short Stories, Best American Essays, Best American Mystery Stories, and the Pushcart Prize Anthology. Hayden’s Ferry Review looks for well-crafted work that challenges readers, takes risks, and engages emotionally and artistically. A small portion of our publication is solicited from established authors, while the majority of our contributors are chosen from the thousands of manuscripts we receive each year. Among the writers and artists who’ve found a home in Hayden’s Ferry Review are: George Saunders, Haruki Murakami, Rita Dove, Joseph Heller, Peggy Shumaker, Raymond Carver, Dianne Nelson, Norman Dubie, John Updike, TC Boyle, Gloria Naylor, Naomi Shihab Nye, Ken Kesey, Tess Gallagher, Pam Houston, Lydia Davis, Benjamin Percy, Matt Bell, B.J. Hollars, Mike Meginnis, and Anne Valente. D. Ellsworth Hoag has been writing poetry for many years. He creates straight-forward poems, often with a satiric. twist. He has nine books now available on Amazon. Each of his books is a thematic collection. You may visit his webpage at dellsworthhoagpoet.com. Holum Press is a radical publishing collective based out of Phoenix, AZ. We produce Oasis, a journal of anticapitalism in the desert. Oasis blends the personal with the critical, and its contributors grapple with anticapitalist themes through essay, prose, poetry, and art. Herbert Marcuse wrote that art becomes revolutionary when it depicts the prevailing unfreedom and the rebelling forces, thus breaking through the mystified (and petrified) social reality, and opening the horizon of change (liberation). In our current situation, where our miserable reality seems unchangeable, we must recognize art as a necessary element of our liberation. Hoot 'n' Waddle is two things. We are the hub for a local podcast network to help promote and grow arts and culture programming in Phoenix, AZ. We are also a small literary press that specializes in collections of poetry, short fiction, and creative non-fiction. Karen Grove, a freelance editor, has spent the last thirty-six years in the publishing industry, first working in the design department of St. Martin's Press, then in the production departments of Hearst Magazines and Academic Press, and (beginning in 1985) in the children's editorial department of Harcourt Brace Jovanovich. She specializes in young adult fiction, collaborating with many fine writers and agents to make certain their manuscripts reach their highest potential. For the last six years, she worked as a Senior Editor at Entangled Publishing, where she edited New Adult and Romance fiction. Iron City Magazine is an online and print journal devoted entirely to writing and art from the prison world. It is our hope that through this creative platform, incarcerated artists and writers find value in their stories, fuel for personal growth, and pride in their accomplishments. Prisoners are, first and foremost, people. They own stories worthy of telling and sharing. Iron City Magazine aims to highlight these stories in a way more permanent than a private journal. In addition, we serve to remind the general public that prisoners can make meaningful contributions to their communities. So often, this potential is forgotten or overshadowed by their crimes. By validating prisoners‚ humanity through writing and art, we encourage a culture of understanding and transformation. Ashley Naftule is a culture writer, playwright, poet, and fiction writer based in Scottsdale, AZ. He's a resident playwright and Associate Artistic Director at Space55, where two of his full-length plays (Ear and The First Annual Bookburners Convention ) have been produced. He's been published in the following places: Culture Writing/Journalism: Vice, Bandcamp, Phoenix New Times, The Outline, Popula, Under The Radar, Pitchfork (forthcoming), Vinyl Me Please, SYFY Wire, Invisible Oranges, Aquarium Drunkard, Tucson Weekly, Spiral Nature, and The Cleveland Review of Books (forthcoming). Fiction: Special projects from Four Chambers Press, The Molotov Cocktail, Hypnopomp, Ellipsis, The Dark City Mystery Magazine, Rhythm & Bones (forthcoming), Coffin Bell Journal (forthcoming). Poetry: Rinky Dink Press, Ghost City Press, special projects from Four Chambers Press, Amethyst Review, Mojave Heart, L'Ephemere Review, Occulum, Bone & Ink (forthcoming), formercactus (forthcoming), Pretty Cool Poetry Thing (forthcoming), and Moonchild Magazine (forthcoming). Moms have stories. Lots of stories. Pregnancy woes. Labor horrors. Adoption successes. Kid adventures. Shipwreck fantasies about kid-free remote desert islands where waterfalls flow with wine... We're the Narrative Nest. A supportive monthly writing group for all kinds of moms and all kinds of writers. Created & facilitated by two professional writers with kids (Devin Pope & Blissom Booblé), we meet monthly in a cozy critique group to provide writing feedback for both the newbie writer and seasoned professional. Learn more by visiting our website or facebook page at www.narrativenest.com and www.facebook.com/narrativenest, or send us an email at info@narrativenest.com. Normal Noise is a semesterly magazine supported by Barrett, the Honors College at Arizona State University. Each issue provokes conversation about the complexities of everyday life through essays, creative nonfiction, journalism, poetry, photography and art. Our print publication seeks to examine the role that the arts and humanities play in shaping cultural, social, and political life in Arizona and especially in the ASU community. We hope to cultivate a space of resistance against the shrinkage of intellectual life and critical perspectives within the university. Brandishing our magnifying glasses, we go out into the wilderness of the New American University, Phoenix, and beyond, asking odd questions in hopes of coming to a new understanding of how forms of power work and shape our everyday life. I'm Suzie Olsen, author of the Annie Aardvark, Mathematician series. I'm also a systems engineer and creator of the blog STEM Spark, which is inspiring kids in science, technology, engineering and math. Shawnte Orion attended Paradise Valley Community College for one day, but he has published two collections of poetry, The Existentialist Cookbook (NYQBooks) and Faithful as the Ground (Five Oaks Press). He is a former Copper State Haiku Slam Champion and his poems have appeared in The Threepenny Review, Barrelhouse, Gargoyle Magazine, and New York Quarterly. He has performed at bookstores, bars, universities, hair salons, museums, and laundromats. Laurie Perez is the author of The Amie Series novels, the novel TORPOR: Though the Heart is Warm and several nonfiction works including the forthcoming TAC Shop: The Invitation for Working Actors. She lives with her daughter, Sachi and partner, Raul in Arizona and is affectionately known by friends and fans as the Joybroker. Lux Undergraduate Creative Review encourages the emerging talent of all undergraduate students by providing a creative outlet for their literary and artistic work. The review is produced with the help of Barrett, The Honors College at Arizona State University. Lux accepts poetry, fiction, visual art, song lyrics, screenplays, creative non-fiction, music, film, and other modes of expression beyond the bounds of traditional genres. We value originality, individuality, artistry, diversity, and passion. Phoenix College Rising seeks to lift and build community through our shared stories. The Creative Writing Program is designed to provide students and professional writers with access to a community of writers and creative writing activities, instruction and guidance from established authors, and ongoing support in improving their writing skills and marketing their work. The Phoenix Writers Network is an exciting new community of writers who meet bimonthly to develop relationships through the exchange of knowledge about writing craft, publishing, and the writing life. Visit us at www.phoenixwritersnetwork.com for information about upcoming meetings and events. My name is Tianne Pitz. Old to the writing game but new to following my passions. I also am an avid collector of all things and I sell toys, video games, and collectibles along with my partner James. I have created 5 Zines which are currently housed at The Wasted Ink Zine Distro as well as on their online shop. I presently table at The Hive in Phoenix for First Fridays. I am branching out into the Zine community and delving into art events in the Phoenix Metro area. rinky dink press - a Phoenix-based publisher of micropoetry microzines, aka micro-chapbooks – believes that poetry should be both accessible and affordable, not to mention visually appealing and a little bit DIY. We’ve published 50 poets to date – from college students to established poets, from every region of the U.S. to Canada and the UK. Bernard "The Klute" Schober is the most recognizable voice from Arizona on poetry slam's national stage. He grew up along the shores of the Atlantic Ocean on Palm Beach, Florida where he cultivated a love of sharks to become an activist for their preservation through the medium of spoken word, and has had the privilege of sharing the waves with those fantastic fish, from the great whites of Isla Guadalupe, Mexico to the reef sharks of Egypt's Red Sea coast. He has represented the cities of Mesa, Phoenix, and Sedona at the National Poetry Slam 10 times between 2002 and 2014 and has opened for spoken word superstars such as Saul Williams and Amber Tamblyn and has been the featured performer in such legendary venues as Vancouver's Cafe Deux Soliels and New York City's Bowery Poetry Cafe. A collection of his chapbooks was published by Brick Cave Media in 2014 (Klutocrypha, Vol.1), and he has had poems published in anthologies by Sergeant Press, Write Bloody, and Four Chambers Press. In 2016, he traveled the United States in support of his new chapbook Chumming the Waters and in 2017 a full volume of work titled Words with the Men in Grey Suits will be released. Both works are described as poetry for sharks, by sharks. The profits from both books are being donated to Fins Attached, a shark conservation organization based out of Colorado Springs. Jesse Parent, a local curmudgeon and YouTube sensation from Salt Lake City says, "The Klute is honest, loud commentary on the political condition. Just because he can be funny doesn't mean he shouldn't be taken seriously. His work is skewering in its sharpness and depth, and entertaining in its craft and delivery. Also‚ shark." Ed Mabrey, a TedX Speaker and Emmy Award Winner, says "The political satire world has its Mount Rushmore: Jon Stewart, Stephen Colbert, John Oliver, Bill Maher. Using his own chisel and hammer, The Klute has climbed that rock and is etching his own likeness next to them, one insightful poem at a time. It's no accident, he belongs there." Karen Shiffman Lateiner recently published her first book, Timeless Dance: A Story of Change and Loss, a memoir chronicling her journey as a mother, adapting to her first child's transition from male to female at a time when transgender issues were still in the closet, and later dealing with the death of her new daughter, only two years after she became who she truly was. Learning about gender diversity led Karen to become an advocate and educator about gender issues, to collect her related writings over the span of more than twenty years and, ultimately, to write her memoir. During those years, she participated in various writing workshops, including the Desert Nights, Rising Stars Writing Conference at the Virginia Piper Center for Creative Writing and Osher Lifelong Learning Institute (OLLI) classes at Arizona State University. Since the publication of her book, she has been scheduling book readings and talks at a variety of venues in New Jersey and the Southwest. Karen holds both an M.A. and M.Ed. in Educational Psychology. Throughout her professional career as an infant development specialist and mental health clinician, as well as in her personal life, Karen has advocated for safe and nurturing school environments for all children. Among her greatest influences are her two children who taught her much about life. After retirement, she and her husband set out from their home in Montclair, NJ to travel the country by motorhome, eventually making Phoenix, AZ their new home. Combining her loves of writing and of the Sonoran desert, Karen encourages other writers in a weekly Hike and Write group she created at the North Mountain Visitors Center in Phoenix. In her spare time, she enjoys hiking, baking sourdough bread, going to museums, opera, and theater, as well as traveling. The Sisters in Crime Desert Sleuths Chapter is a proud member of Sisters in Crime, an international organization that promotes the ongoing advancement, recognition and professional development of women crime writers to achieve equality in the industry, raising professionalism, serving as the voice for excellence and achieving diversity in crime writing. The Sisters in Crime Desert Sleuths Chapter is located in the Phoenix Metropolitan area and serves members throughout the State of Arizona. Our members include bestselling, award-winning authors as well as emerging writers, fans of mysteries and crime stories, and other genres. Whatever your level of experience, you are welcome to join us. Margaret Ann Spence writes fiction and essays. A love of baking, Boston (where she used to live) and all things British inspired her novel, Lipstick on the Strawberry, published by The Wild Rose Press. The book won the First Coast Romance Writers 2015 Beacon Prize, Romantic Elements category. Margaret is a member of The Tempe Writer's Group. Jennifer Spiegel is mostly a fiction writer with two books and a miscellany of short publications, though she also teaches English and creative writing. She is part of Snotty Literati, a book-reviewing gig, with Lara Smith. She lives with her family in Arizona. Love Slave, with its slightly deceptive title, is a New York novel full of acerbic, witty, and heartbreaking moments--not to mention quite a bit of cultural critique and Gen X woe. The Freak Chronicles is a short story collection with two kinds of stories. There are Domestic Freaks, and there are Freaks Abroad. Stories are set in the U.S., South Africa, Cuba, China, and Russia. And So We Die, Having First Slept, a second novel, following ten years of an unorthodox marriage involving Sappho, brain injury, and bath salt addiction, will be published in December 2018. Spiegel is also a co-editor of Dead Inside: Poems and Essays About Zombies. Currently, Spiegel is working on a memoir, Cancer, I'll Give You One Year: A Non-Informative Guide To Breast Cancer, or Cancer, I'll Give You One Year: How To Get Your Ba-Da-Bing Boobies On The House! Superstition Review is the online literary magazine produced by creative writing and web design students at Arizona State University. Founded in 2008, the mission of the journal is to promote contemporary art and literature by providing a free, easy-to-navigate, high quality online publication that features work by established and emerging artists and authors from all over the world. We publish two issues a year with art, fiction, interviews, nonfiction and poetry. Marilyn Szabo is a veteran photographer for over twenty five years. Since 2003, Szabo has worked on a large curatorial project for Alliance Bank, which included extensive research, selection and or photographed over 350 images. The 168 page book titled At Work in Arizona: The First 100 Years is a history of the state's economy. She is currently producing a book about the photographer James L. Gorraiz, which will consist of a biography of James Gorraiz with a curatorial perspective on his images and their importance to Arizona history and to the nation. It will include approximately 150 images from the Gorraiz photographic collection. His documentary work is part of a lineage that includes Walker Evans and represents a very special period in Arizona/American history from 1945 to 1970. Waking the Dream is a boutique consulting company with a mission to inspire, educate, and transform. We foster personal growth for clients, and consulting services range from personal coaching sessions to aid creative processes, to writing and editing services to ready written works for publication. A partial list of services includes manuscript editing, query letter review, book proposal consultation, publishing consultations, author website design, and interior and exterior book design. Eugene Ward: I am an outside the box Christian novelist specializing in fringe ministry. My artistic vision is not only for those seeking a deeper understanding of their existence and relationship to the Creator and the universe, but also those who enjoy a well-crafted story addressing the very questions of our existence and morality in an enjoyable and approachable way. I seek to transcend categorization and engage readers unconventionally, attracting a wide variety of individuals from all walks of life. wards is a literary journal based on its versatile title. Each issue invites writers to submit fiction, poetry, creative nonfiction, and essays based on a theme. Our goal is to reflect a range of unique experiences and perspectives with each issue's theme. Wards are watchers, wards are storied places, and warding is an act of defense or self-preservation. Wards possess a unique point of view, and are often isolated. wards gives you a turn to tell your story. wards is currently published in digital format. each issue is available as a free .pdf download. Kimberly Williams has an MFA in Creative Writing from University of Texas El Paso and teaches writing at Glendale Community College. Kimberly also spends an inordinate amount of time traveling, day dreaming, reading, doing restorative yoga, and napping—doing anything, really, that honors and incites her imagination. She has published one collection of poetry, Finally, the Moon, published by Stephen F Austin University Press. Carly Schorman is founder and senior editor at YabYum Music + Arts, a multimedia digital publication that has been providing original content everyday for nearly a decade. For the past five years, we've worked in partnership with Radio Phoenix and this year we've been expanding our operation from an online magazine to also include several new podcast platforms, including Prizefighting Kangaroo (film and movie culture), The Mortician's Daughter (facing your existential crisis head-on) and our forthcoming blockbuster, Confessions from the Nocturne Nebula, a science-fiction space-noir serial drama. Amy Young: Writer - news, nonfiction, poetry. Co-host of cinema and culture podcast. Drummer. Curator. In addition to meeting local authors and literary organizations, Meet Your Literary Community features numerous ways for community members to engage with the literary community. Leave a book; take a book. Replenish your bookshelves with a community book exchange. Writing groups are places where writers come together to exchange compassionate, constructive, and thoughtful feedback on each other's work. After a short presentation on what writing groups are, where to find them, and how they work, we'll break out into workshop. If you're interested in receiving feedback, please bring four hard copies of one poem or short piece / excerpt of prose (1500 words or less). Please note: given limited time, bringing work does not gaurantee feedback. Individuals who do not receive feedback will be directed towards community resources. Where can you find literary journals? How do you submit? What are editors looking for? What do they do? Join the editors of Hayden's Ferry Review and Superstition Review for a informal panel and Q&A on the in's-and-out's of the submissions and editorial process. Local Author Reading: 11:00 a.m. to 12:00 p.m. There will also be a literary scavenger hunt, prize giveaways, and more. For the activity, I will provide a written poetry prompt for each young person. The prompt will have my email address on it, with an invitation to send the finished poem to me. I will respond with feedback by email to each poet. Meet award-winning author Piper J. Daniels and get a signed copy of her debut book, Ladies Lazarus. Schedule a manuscript consultation or ask for a writing exercise that will cure you of writer’s block. Commission a poem on any topic of your choosing which will be delivered to you on the spot. While you’re waiting for your poem, participate in the writing of an Exquisite Corpse Poem, in which every person anonymously contributes one line. The final product will be published on social media and on PiperJDaniels.com. Print a Bookmark on a 100-year-old Press: My Multigraph, a hand-cranked rotary press, will be with me, so people can make their own bookmark. I’ll also have my new book, By the Forces of Gravity (Books by Hippocampus, 2018), and my zines, Tiny Joys and Wordlings, (published through Plankton Press) available for purchase. Writing my two memoirs taught me how to find the courage to speak one's truth in life, and how essential this is for mental and emotional health, particularly for young ages who can be most fragile. Let’s have a discussion! Take a word that represents an emotional state and we'll chart a new trajectory leading to uplift. Feeling stuck? We'll chart a path to brilliantly untethered. Feeling small? Aim your compass toward grand or cosmic or colossal! Expect laughs, inspiration and sometimes that rare gem: full-blown creative epiphany. Kimberly's table will offer a writing game for writing starting and flash-writing first drafts of poems. Use fate, destiny, Lady Luck, or what-you-will in the process of making poems. Appropriate for all ages. As part of the event, space will be provided for local authors, small presses, or other organizations related to literature and creative writing to engage with the community. To apply for this event, read the guidelines below and submit an application. Applications for this event are currently closed. In the meantime, feel free to sign up for our mailing list or follow us on facebook or instagram to learn more about other opportunities for tabling. Any individual representing themselves as an author or a literary organization or business are encouraged to apply. Authors should have copies of a book, chapbook, or some other kind of printed publication or material available for distribution or sale. Books do not need to be published with a traditional publisher: self-published books, hand-made editions, zines, or similar products are welcome. Preference will be given to authors with some sort of printed material available for distribution or sale. Beyond engaging with community members, participants are welcome to distribute information about themselves or their organization, as well as selling any books or other literary products or services. 10% of all sales will be donated to the Phoenix Public Market. Participants are responsible for providing their own change and point of sale systems, ensuring compliance with city and state tax laws, and all other aspects of conducting sales. Participants are also encouraged to offer some sort of dynamic, interactive activity or other form of engagement for writers, readers, and the general public, with a particular emphasis on activities for youth. Preference will be given to applications including an activity. Authors will also have the opportunity to participate in a community reading and showcase from 11:00 am to 12:00 p.m. Participants will share space with up to 2 other individuals and organizations. The Public Market will provide a 6' table, 1 chair, and canopies. Participants are encouraged to bring any linens, decorations, or other displays for their table. Electricity will not be available. As temperatures can still be somewhat high in early October, please bring water and dress appropriately. While space is open, selections may be made on the basis of diversity and representing the larger literary community. There is no cost to apply; space is free. Applications are simple, and consist primarily of contact information and brief descriptions. The deadline for applications is Saturday, September 1, 2018 at 11:59 PM (Phoenix Time). Participants will be notified by Monday, September 17, 2018. If you have any questions, please contact Marketing and Outreach Specialist Jake Friedman at 480.727.0818 or jake.friedman@asu.edu.